How do I add an announcement in a group? As a student, you can make an announcement within a group. You can also add an announcement in the Group Home Page by clicking the Add New Announcement button. Add content to your announcement. You can add a title , write a message , and add information from the Content Selector . View the announcement in the announcement page. Previous Topic:How do I view Announcements as a student? Next Topic:How do I edit an announcement in a group? 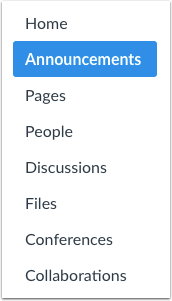 Table of Contents > Announcements > How do I add an announcement in a group?